Hello, hello, all you lovely readers! My name is Seth Cross -as always, you can call me “DM” – and I am very excited to bring you another installment of the Replacement Commanders series here on EDHREC! This series was was inspired last year by all the awesome new legendary creatures that were not on the face of the Commander precon decks, and who simply didn’t get nearly as much attention as they deserve. With this series, we grab hold of the spotlight and shine it on those unsung, often exciting, and very unique commanders, building a precon-like decklist around them. This allows their own unique abilities and strategies to shine, instead of forcing them to helm decks made for different legendary creatures. For example, last time we looked at Gyrus, Waker of Corpses. Both he and Thantis, the Warweaver have shown to be very interesting commanders of their own lists, but had very little to synergize with the “lands matter” theme that Lord Windgrace had built around him for the precon. For those of you who do not know (and in the event I have not revealed this previously), I love Magic lore. I love the art as well, but the stories and characters behind the cards are one of my favorite aspects of the game. People who experience and enjoy this game are commonly referred to as Vorthos players, and this part of me went crazy when Brudiclad was previewed for Commander 2018 because it harkened all the way back to Sarcomite Myr’s flavor text! There is very little information available about Brudiclad that was not revealed in the insert of the product itself. If there is more out there, feel free to let me know in the comments down below. So what does Brudiclad do in the game? Given the typical strategy we’re used to seeing in Izzet colors, mechanically, Brudiclad should pique everyone’s interest, because it’s shifted us into token territory! The only other legendary creature in the same colors that works with tokens at all is The Locust God, and the tokens are more a product of card advantage, which is somewhat different from what Brudiclad wants to do. With this deck, we are encouraged to make pretty much any kind of token (even noncreature tokens) and at least one token we want to see more of. As we enter the combat step, every token on our field (even our Treasure or Clue tokens) will turn into that same kind of token. From there, we can swarm our opponents with a field of flying Drakes (from Talrand, Sky Summoner, for example) or even multiple Brudiclads with the use of Helm of the Host. It stands out to me that Brudiclad seems to require the same kind of setting up that the other Izzet Replacement Commander, Tawnos, Urza’s Apprentice, needs before going off and ending the game. For Tawnos, it was combo pieces. No point in running him out onto the field until we’ve assembled toys for him to play with. Brudiclad is similar; a 4/4 body that costs six mana feels like something we want to play at the right time, and not necessarily run out as soon as possible. This requires a critical mass of tokens to take full advantage of the copying ability. It is important to remember that these do not have to be creature tokens. The first card to discuss for the deck as a standout card for Brudiclad is Brass’s Bounty. By itself, this card seems to be a lackluster downgrade from green’s Boundless Realms. However, if we cast Brudiclad turn six and Bounty on turn seven, we’re going to have eight 2/1 Myr tokens with haste (remember that Brudiclad makes a Myr at the beginning of combat), and all this can really set a tone for the game. Some other cards that make a plethora of tokens on the spot are Thopter Assembly and Siege-Gang Commander. I like that Tempt with Vengeance becomes less straightforward of a deal for the table. While everyone else can choose to get 1/1 Elemental tokens, we can get… well, with the right spells, we can get almost anything we want! Quasiduplicate is an awesome new copy spell from Guilds of Ravnica because it is relatively cheap and gives you two attempts to make copies with the Jump-Start mechanic. In a deck where there are bound to be some high-value artifacts, Saheeli’s Artistry is another good one. 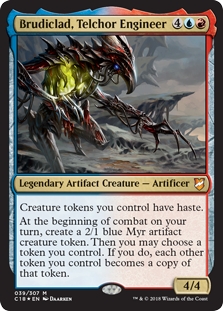 It’s even better when we realize we can double target things like Myr Battlesphere, which is both a creature and an artifact. Feldon of the Third Path and Flameshadow Conjuring are also great ways to make token copies of our own creatures, either from the graveyard or by entering the battlefield. One of my personal favorites that I saw from the EDHREC page for Brudiclad was Call the Skybreaker, which creates a big, flying token and is repeatable thanks to Retrace. As someone who enjoys political playing, I think Curse of Opulence is another great way to make tokens. Honestly, we have to do very little if the Aura is placed on someone people want to attack anyway. As I was reviewing the EDHREC page for the Telchor Engineer, I noticed that many of the important cards of the deck (ones that created tokens) were instants or sorceries. This made me consider a few new possibilities, like adding Archaeomancer to fetch back those token-making spells for redundancy, but then I thought of something even better. What if we ran some spell copying synergies and gave the deck a traditionally blue-red spellslinging twist? This idea got me even more excited when I thought of turning all the little tokens we can make in the deck into Treasure tokens and then fueling a huge Banefire or even a Jaya’s Immolating Inferno to wipe out the table. Thousand-Year Storm was already on the page, and this is a card I have been wanting to experiment with. I like the idea of running Sunbird’s Invocation for the sake of added value and then Swarm Intelligence as another way to get extra instances of spells we cast. Ironically, I chose to leave Twinflame out of the deck for the sake of putting Dualcaster Mage, though I like to avoid potentially infinite combos like the ones Dualcaster is occasionally involved in. Noting that, I feel it is important to address the exclusion of Godo, Bandit Warlord to tutor up the aforementioned Helm of the Host, since the two cards go infinite together and one helps find the other. The spellslinger subtheme makes some of our other includes even more powerful, so I want to point out a few of them so that we can take special notice of important or key cards. We already looked at Talrand, but we also have Murmuring Mystic and Young Pyromancer to pump out more tokens. As always, I love discussing the decks and commanders with all of you readers, so make sure you follow me on Twitter or join my public Magic: the Gathering Discord server and maybe you can help me out with the next article! Until next time, keep brewing and keep having fun!